HOW CAN POWERBALL® HELP ME? Wrist sore from RSIs like sprains or breaks? Powerball® it away! Great products achieve great results. Powerball’s advanced spin techology produces a 100% non-impact resistance. This drives enhanced blood flow right through the arm and is one of the most natural ways possible to rehab and strengthen sore, inflammed muscle and tendon tissue. 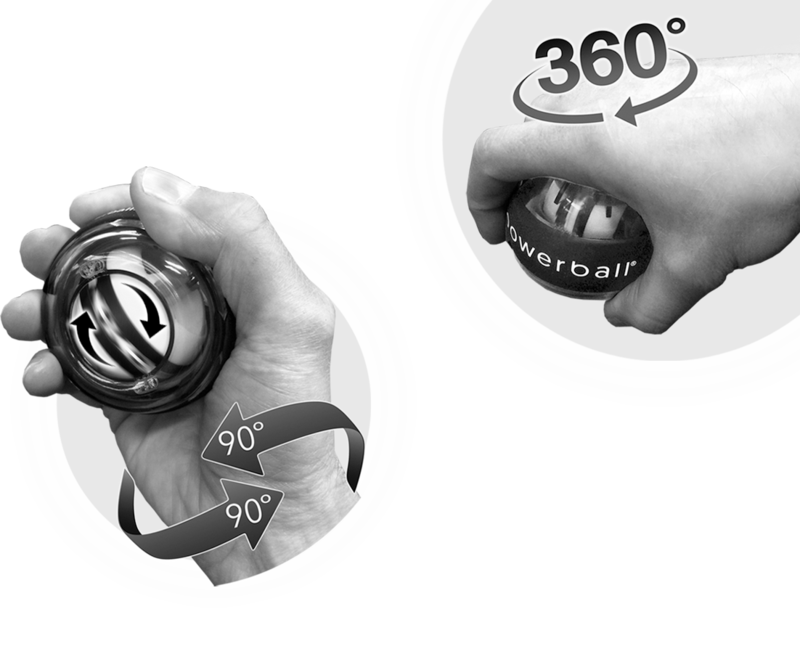 You will feel immediate relief from the moment you place a spinning Powerball® in your hand. WHICH MUSCLES AM I TRAINING? Spinning at high speed requires both power and endurance in the entire kinetic chain from fingertip to shoulder. Arm muscle builds rapidly. Trusted by climbers and sports enthusiasts in over 200 countries worldwide, Powerball's revolutionary isometric resistance builds strength and endurance in the hands & fingers like no other exercise device in the marketplace today. 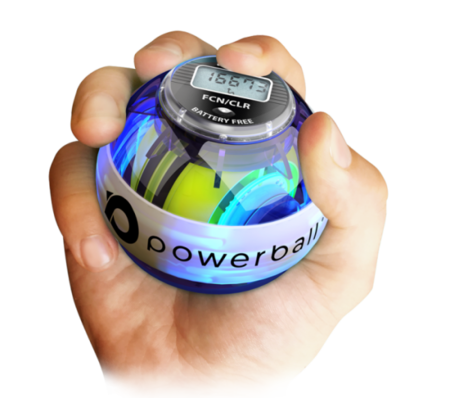 Powerball's range of physio designed exercise programs are easy to follow; hold the ball with just the fingertips and spin at moderate speeds for 2-3 minutes several times daily - you'll rapidly create powerful, nimble & highly dexterous fingers…and build crushing grip strength in the process. Typing, twisting, driving, brushing, serving, turning, flicking.. the highly complex wrist is the most used joint in the body and is susceptible to a wide range of mobility limiting conditions such as carpal tunnel syndrome, tendonitis, arthritis, numbness and breakage if not properly exercised and maintained. Simply spinning Powerball® for 2-3 minutes several times daily ensures that the wrist remains stable, flexible and strong and helps keep it immune from the many ailments fostered upon the joint by today’s active lifestyles. Spinning Powerball® for 2-3 minutes, several times daily, or following one of the physio designed exercise programs, helps promote powerful blood flow throughout the tissue and builds strength and endurance in the muscle. This keeps your forearms strong and supple and ensures excellent range of motion at the elbow. Powerball® is perfect for improving forearm and grip strength in all training regimes, regardless of current fitness level. Track your strength gains with Powerball's on-board speed computer and test your progress in both muscle endurance and power. Simple movements (typing, writing, sports, gardening, gaming etc), performed thousands of times each day cause tiny tears in your forearm muscles (overuse / RSI), bringing tightness, inflammation and pain around the elbow joint. The smooth, non-impact resistance generated by spinning Powerball for 2-3 minutes, several times daily helps strengthen the forearm muscles, lubricate the elbow joint and drive significant blood flow right throughout the arm to both rehabilitate and prevent against the effects of all RSI related conditions, keeping your arm healthy and strong from fingertip to shoulder. The shoulder is a highly complex joint that's particularly susceptible to injury. Powerball® offers a range of physio designed exercises to specifically target the shoulder extensors, abductors, flexors, external rotators & shoulder girdle. Spinning Powerball for just 2-3 minutes, several times daily, helps to strengthen and maintain stability in the shoulder blade and rotator cuff muscles and ligaments - it also enhances blood flow, helping ensure smooth movement of the shoulder joint, regardless of the sport you play or the task you need to carry out. 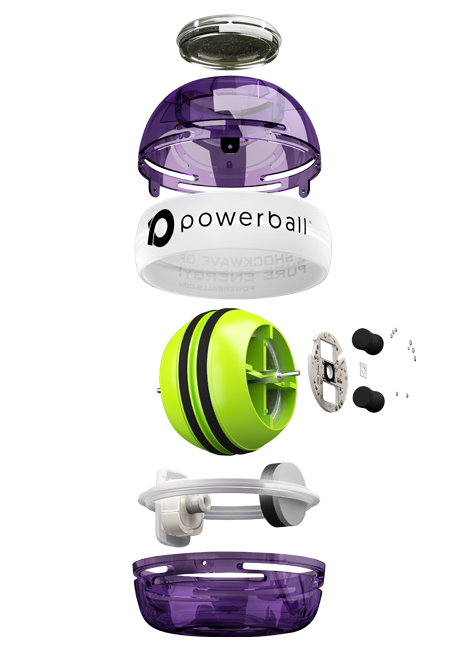 Whatever your game, spinning Powerball® will help you play it far better. Powerball® should be used and stored in a dry, dust free environment. We recommend periodically wiping down the body shell and grip band of your Powerball® with a damp cloth as this will improve overall grip during use. Powerball® can be opened and cleaned if required – consult our ‘How To’ FAQs for details. Never oil Powerball’s internal components as a single drop of oil applied to any internal part is sufficient to destroy the resistance which occurs between the moving parts inside the body shell – and the ball will no longer function. 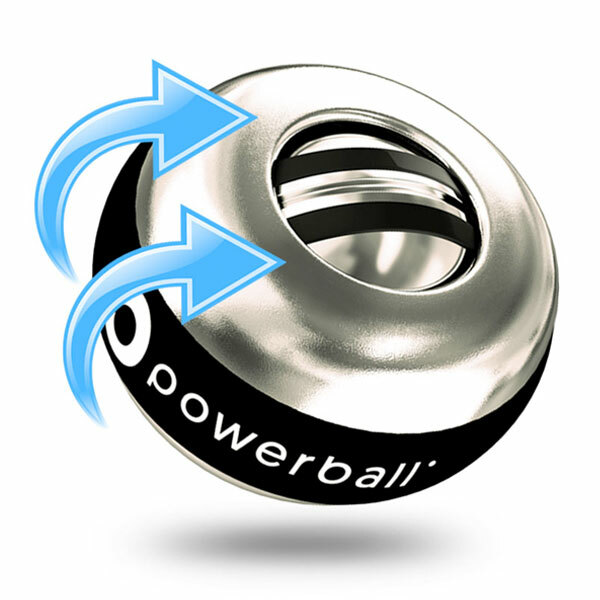 Always keep a firm grip on Powerball® as you spin to ensure it remains ‘out of the box’ smooth for many years of operation. Monitor your spin performance and strength gains with the built in digital display and speed counter. 688 Range: High impact polycarbonate body shell. Zinc / ABS rotor. 588 Chrome: Polished stainless steel body shell. Solid zinc (heavyweight) rotor. 588 Gold: Polished stainless steel body shell. High speed (lightweight) milled aluminium rotor. Ultra-Grip Silicone Band: Tactile to hold at any speed, allows greater control. Each Powerball® is carefully hand built from wear resistant materials of the highest quality to help ensure many years of ownership satisfaction. In fact, we are so confident in this premium quality that each Powerball® is supplied with a Lifetime Manufacturers Warranty.